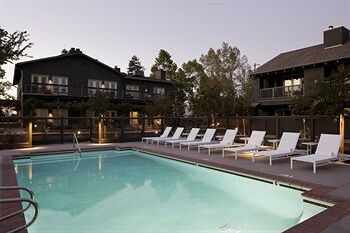 Property Location Located in Napa, SENZA Hotel is convenient to Trefethen Family Vineyard and Andretti Winery. This romantic hotel is within close proximity of Alston Park and Darioush Winery.Rooms Make yourself at home in one of the 24 individually decorated guestrooms, featuring iPod docking stations and flat-screen televisions. Complimentary wireless Internet access keeps you connected, and cable programming is available for your entertainment. Bathrooms feature shower/tub combinations, designer toiletries, and hair dryers. Conveniences include phones and in-room massages, and housekeeping is provided daily.Rec, Spa, Premium Amenities Enjoy recreational amenities such as an outdoor pool and a spa tub. Additional amenities include complimentary wireless Internet access, concierge services, and wedding services.Dining Meet other guests and eat at a complimentary reception. A complimentary continental breakfast is served daily.Business, Other Amenities Featured amenities include a business center, limo/town car service, and complimentary newspapers in the lobby. Planning an event in Napa? This hotel has facilities measuring 900 square feet (81 square meters), including a meeting room. Free self parking is available onsite.